Tribal Clash athlete keeps up her training and is put through her paces on UK series ‘SAS: Who Dares Wins’! Tribal Clash veterans will know that it’s a competition unlike any other, pushing teams to their limits and testing them on a range of primal movements. One Tribal Clasher recently undertook a challenge which took her even further outside her comfort zone, hitting screens in the UK as a recruit on Channel 4’s ‘SAS: Who Dares Wins’. 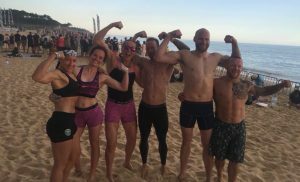 Having competed with her team from CrossFit Cumbria in Portugal in 2018, Hannah Jackson decided to take the ultimate test: to be put through her paces by ex-Special Forces soldiers in a process which recreates SAS selection. 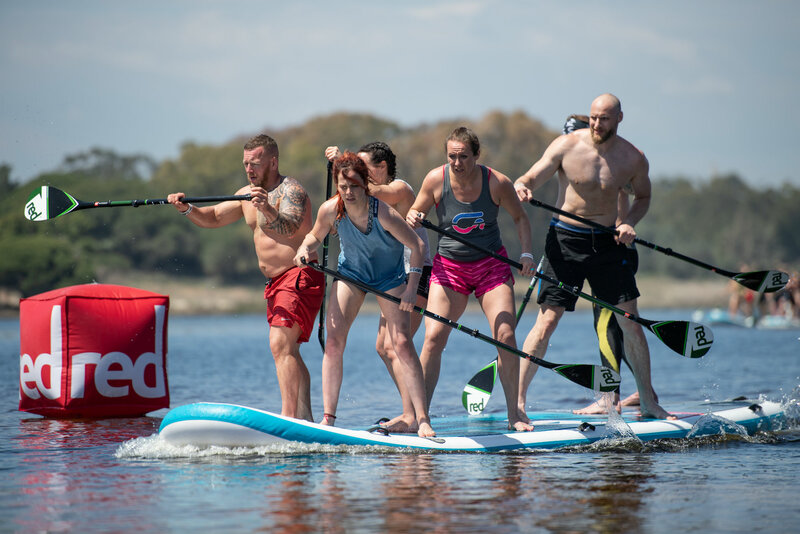 We caught up with Hannah to find out how Tribal Clash inspired her to apply for the programme, what the similarities were between the two challenges and how she’s getting ready to compete again in Portugal in 2019! What inspired you to apply for the show? It actually all began with taking part in Tribal Clash Portugal 2018! In April last year I joined CrossFit Cumbria after having about 5 years off CrossFit. A couple of weeks later I was invited to join a team in Portugal – I thought they were joking as the rest of the team were all amazing but I said yes and the next thing I knew I was on the plane to Portugal. I was terrified initially as everyone around me was so fit, but I was hooked as soon as we started the first event, a team log run followed by a trail run. The adrenaline pump, the challenge, the fact you were with the team who you didn’t want to let down; I loved it all. We reached the final in Portugal and finished in twelfth place, then afterwards I was buzzing for weeks and just needed something else – another challenge, more adrenalin, the chance to push myself to the extreme. I’ve always loved SAS and when I saw that they had opened applications to women for the first time I knew I had to go for it, so I applied and was chosen from 5000 applicants to be one of the 25 recruits! As you mentioned, this was the first year that females were allowed to take part in SAS: Who Dares Wins, reflecting the fact that women are now allowed to join the Special Forces. How did you feel to be in direct competition with men? I’m really competitive and always want to be one of the best, whether I’m up against males or females. Some of the guys on SAS were impossible to catch but I always stayed in around 5th place in the physical challenges – as long as I could keep the leaders in my sights I was happy! In my opinion women often have a lot of mental strength which is really valuable. For those who haven’t been watching SAS: Who Dares Wins (Channel 4), can you please bring us up to speed with how the elimination process works? Yes of course. Just a few weeks after I got back from filming the series in Chile my coach at CrossFit Cumbria got a log out and said ‘right we’re going for a run’…definitely not what I wanted to do! I did learn a lot from taking part in SAS though as I now know how to get into a completely different zone mentally. Why do you think you were selected to take part in the series? I think that I actually believed in myself a lot more because of Tribal Clash – as well as leaving me with a craving for more challenges, it had given me a lot of confidence and shown me that I can do things that I hadn’t expected. I really tried to get that idea across to the producers and show them that my limits were further than I had thought. How do the primal movements of Tribal Clash relate to your day-to-day life? I work with sheep, cows and dogs all day – I love it! Farming definitely keeps me fit as I’m constantly walking up hills, lifting feed bags, throwing hay around and chasing after animals; plus my grip strength is amazing from catching sheep and trying to hang on to them! I wasn’t always a farmer though – I actually grew up on the Wirral but always loved animals and being outdoors, so after University I took the plunge and moved to Cumbria! Did Tribal Clash help you get through the challenges the series threw at you? Yes! There were loads of times, especially during the log run – I got quite excited when I saw the log thinking ‘yes, we did this at Tribal Clash and I loved it!’ Then I realised how heavy it was and how steep the mountain was…The whole time I was telling myself to pretend it was hot and I was on the beach at Tribal Clash! I was also trying to support everybody else and encourage them to keep going. We were subjected to a lot of beastings which included carrying a partner on your back and holding rocks above your head for as long as possible – with challenges like that I felt pretty confident as I’d done something similar at Tribal. I just had to make sure I kept that mentality of hanging on as long as possible and not letting my head give up! When I was in Chile I really appreciated that I’d been to a Tribal Clash competition as it prepared me so much. Now I’m back from filming the series I’m in a proper Tribal training programme as I just want to smash it this year! Do you prefer taking part in a challenge as an individual like you did on the SAS series, or working as a team as you do at Tribal Clash? On SAS it’s true that you are doing for yourself as an individual, but you become so close to the other recruits that you feel like everyone is really supporting each other and looking out for each other. You only feel like you’re on your own when you’re halfway up a mountain taking part in a gruelling challenge and you’ve got to fight your own demons to make yourself carry on. On SAS you need to have the ability to self-motivate, whereas at Tribal Clash you’ve always got your teammates pushing you – I think that having worked in a team environment previously, I actually found it easier to motivate myself as I had already learnt what to say to encourage others. Given the choice, I would definitely choose to compete as part of a team as it makes me work so much harder and I love having the support of my teammates. Achieving something as a team is amazing and the celebrations are so much bigger when there are six of you! What did you achieve at Tribal Clash Portugal 2019 that you hadn’t expected? We reached the final in Portugal which was a massive surprise as my teammates had told me that they’d never got past the tug of war before! The tug of war itself was so tough, then we had some confusion where we thought we’d pulled the other team over but we actually hadn’t won yet…we started celebrating leaving just one person holding onto the rope, then the rest of us realised and it was sheer panic to get back on the rope to pull it across the line! My heart was racing, my forearms were burning; I honestly don’t know how we clung on. Tug of war is seriously hard – that’s a whole mind game in itself! What’s your most memorable moment from Tribal Clash Portugal 2018? One moment would obviously be the tug of war, but I also feel like I’ve got unfinished business with the atlas stones! I had never picked up an atlas stone until five days before Tribal and thought there’d be no way I’d be able to lift any of them. I managed to lift the lighter stones in Portugal but not the heavier ones, so I’ve been training hard and can almost get the 65kg stone to my shoulder. Atlas stones had better feature this year or I’ll be fuming! What would you like to see programmed during the Tribal Clash 2019 season? I actually like the thrill of the suspense; just showing up and not knowing what’s going to happen other than having to lug heavy stuff around and climbing up ropes! How would you describe Tribal Clash to someone who’s never heard of it? 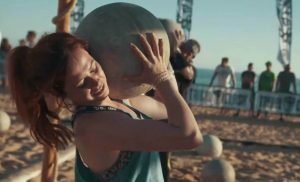 It’s a badass fitness competition on the beach which draws people from all over the world, and you do epic things like flip tyres and carry logs with your team. How does Tribal Clash make you feel? Confident. Invincible. Like I could do anything! That’s fantastic…thanks for chatting to us Hannah – we’ll definitely be watching you on SAS and look forward to seeing you in Portugal!